I’ve art directed a lot of models in the past, from babies to middle-aged men, but a recent photo shoot with kittens was a real eye-opener! 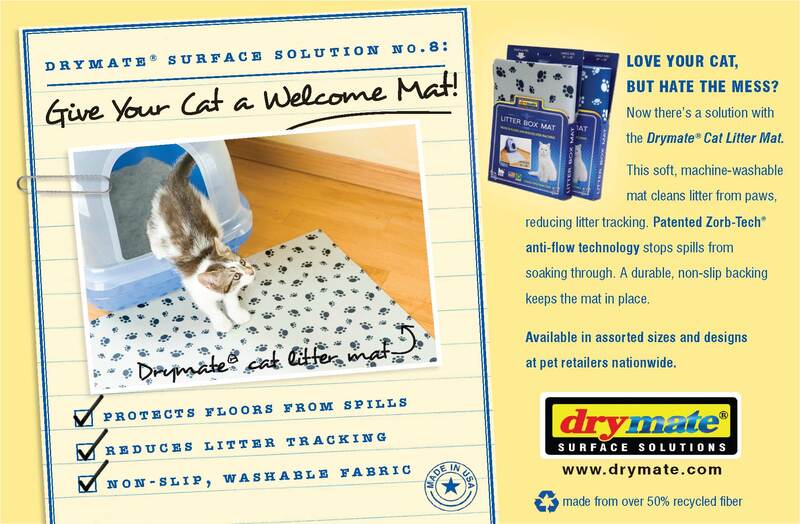 Our client, Drymate (R) Pet Mats, was seeking a photo to include in the last of three ads we did in a series of “Drymate Surface Solutions” ads. They already had a great photo for their Dog Food Place Mat—a Mastiff lying in front of a very messy bowl. And they had staged a beautiful shot of their Grill Mat protecting a wooden deck surface. But a search through stock photography featuring cats and litter boxes quickly made it clear to me that: 1) Cats and litter boxes are not cute. 2) Adult cats usually look ticked off in photos unless they are being pet or fed. Kittens were the obvious choice. Kittens can make anything look cute, even cat litter. So Drymate set out to find kittens to borrow for the shoot, and I called on my frequent collaborator, Rod Wilson of Andrews Photography, to do the shoot at our new home. When the kittens arrived, they were a bit shaken from the ride over. Ruth, from Drymate, picked up the little white one and made instant friends with the little gal. The other two eventually zipped out and hid behind our couch. The shoot was getting off to a slow start! Eventually, we placed the kittens into the frame and began photographing like crazy. We quickly learned to photograph the kitten who was currently the most at ease, art directing his movement with a green feather wand. Over time, the kittens warmed to their environment and we started getting some fun, playful shots. We quickly swapped out the different product versions—including their Cat Food Mat— and just kept shooting and waving our little wand like crazy until we got the right shot. The shoot was part art direction and part kitten wrangling. At one point, the president of the company, his assistant, and myself were all on our hands and knees, trying to coax the kittens from behind couches and under our entertainment center. This entry was posted on Thursday, July 9th, 2009 at 9:07 am and is filed under Design Tricks and Tips. You can follow any responses to this entry through the RSS 2.0 feed. You can leave a response, or trackback from your own site. Love that shot of the cat happily flying out of the litter box! We just got a brand new kitten and ‘fly’ she does. They’re a delight to watch. I can’t imagine wrangling them for any reason – they’re the quintessential free spirit! Good job Katrina! !